AMSOIL's powerful Industrial Oils offer solutions to your lubrication strategies. SE Series SIROCCO™ Compressor Oil - SE Series Synthetic Ester Compressor Oils/Coolants. NEW (2012) All-Season, Anti-Varnish, Anti-Wear Multi-Viscosity Hydraulic Oils - New Low Cost! AW Series - Anti-wear available is a wide range of viscosities. Printable Data Sheet - first to meet MEHF! Synthetic SG Series Gear Lubes for extreme pressure and shock loading conditions. ISO 100 to 680. Call 800-579-0580 for current pricing. We can email you the current commercial list. If your business depends on your compressors of any type, we have a product for you. AMSOIL Synthetic PC Series Compressor Oils are made from high quality, shear stable synthetic base oils. PC Series oils provide long compressor life through reduced component wear, corrosion protection, water resistance and lubricant breakdown resistance. These oils reduce maintenance costs by extending drain intervals and lowering labor and used product disposal requirements. Save over $1000 compared to Sullair Sullube 32® or Ingersoll-Rand SSR Ultra Coolant®. And that is only the initial savings. UPDATED - Printable Data Sheet on SEI Compressor oil. 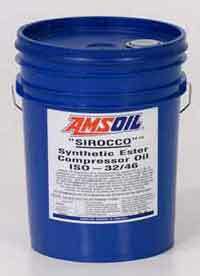 AMSOIL SE Series Synthetic Ester Compressor Oils/Coolants are formulated with premium synthetic ester technology. These high quality, long life fluids last several times longer in use than mineral-based oils. AMSOIL SE Series Synthetic Ester Compressor Oils/Coolants are fully formulated with non-detergent additives and are designed for use in rotary screw, vane and reciprocating compressors. SE Series Synthetic Ester Compressor Oils/Coolants increase operating efficiency, reducing money spent on energy, repair and maintenance costs. AMSOIL SE Series Synthetic Ester Compressor Oils/Coolants maintain performance across a wide operating temperature range. The low pour points, high viscosity indices and lack of paraffins (wax) make these excellent all season lubricants. At high temperatures, SE Series Synthetic Ester Compressor Oils/Coolants form virtually no carbon, allowing for clean operation. At cold temperatures, equipment starts easier and the lubricant is quickly pumped to critical components, preventing lubricant starvation and excessive wear. SE Series Synthetic Ester Compressor Oils/Coolants also resist water to prevent damaging oil/water emulsions, allowing for longer lubricant life and ease of water removal from the sump. AMSOIL SE Series Synthetic Ester Compressor Oils/Coolants have higher flash, fire and auto ignition points than competitive petroleum oils. Their resistance to carbon formation and the ashless additive system minimize the incidence of deposits acting as ignition-promoting hot spots. Although AMSOIL SE Series increase fire safety, they cannot be considered non-flammable. AMSOIL SEI is a multi-viscosity oil meeting the requirements of 5W-20. It may be used in applications calling for either an ISO-32 or ISO-46 compressor oil or coolant. It is recommended for use in single and multi-stage rotary screw compressors and vacuum pumps that call for this viscosity. When installing AMSOIL SEI, it is recommended that the old oil be thoroughly drained and if warranted, the system cleaned. If a lot of carbon or residue is found on the internal compressor parts, follow the manufacturer's recommendations for removal prior to installing the new oil. AMSOIL SE Series Synthetic Ester Compressor Oils/Coolants have a high level of solvency and may remove deposits left in the system. Check the filters and oil/air separators regularly for the first 500 hours of operation and replace as necessary. AMSOIL SEI is compatible with and recommended as a replacement for much higher priced polyalkylene glycol (PAG) compressor oils or coolants such as Sullube 32® and Ingersoll Rand SSR Ultra Coolant®. No flushing is necessary when changing over from Glycol Coolants to AMSOIL SEI. However, draining the system and changing the filters is recommended. AMSOIL SEI is recommended for use up to 8,000+ hours for most compressor applications. However, this is subject to operating conditions and maintenance practices. * Monitoring by oil analysis every 1,000 hours is recommended. * Where discharge temperature exceeds 205°F, lubricant life expectancy is reduced. AMSOIL SEI is compatible with petroleum oils, most synthetic oils*, and many seals, paints and materials commonly used in compressors. Materials recommended and not recommended for use with SEI oils/coolants are listed below. For additional information, see the AMSOIL Compatibility Guide (G-1274) or consult your AMSOIL Dealer or AMSOIL INC.
*AMSOIL SE Series is NOT RECOMMENDED as a replacement or for use with the silicone based compressor oil Sullube 24KT®. AMSOIL SE Series is NOT RECOMMENDED for use in "Breathing Air or Refrigeration" compressors. Nitrogen, hydrogen, helium, carbon monixide, carbon dioxide (dry), ethylene, methane, propane, butane, propylene, butylene, natural gas, benzene, butadiene, furnace (crack gas), hydrogen sulfide (dry), sulfur hexafluoride, synthetic gas, sulfur dioxide. 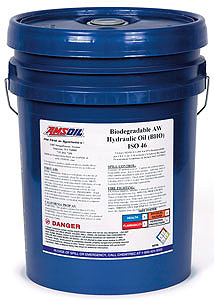 AMSOIL SE Series is available in 5-gallon pails, 55-gallon drums, 275-gallon totes, and bulk quantities. For 275-gallon totes, please allow two to four weeks for delivery. Sullube 32® and Sullube 24KT® are trademarks of the Sullair Corporation. Ingersoll-Rand SSR Ultra-Coolant® is a trademark of Ingersoll-Rand, Inc.
More data on our main Industrial page. Then Allow us to set up an commercial account for you so you can order at wholesale anytine online. AMSOIL Industrial Lubricants are formulated to exceed accepted industry specifi cations. AMSOIL warrants that the use of its lubricants will not cause mechanical damage to any mechanically-sound equipment when AMSOIL products are used in full compliance with the company’s recommendations. However, the purchaser is responsible for determining if these specifi cations are adequate and proper for the intended application. The AMSOIL warranty is limited to lubricant performance consistent with indicated specifications. No additional warranty, expressed or implied, can be made. For additional warranty information click here for lubricant warranty PDF. AMSOIL products are available in 5-gallon pails, 55-gallon drums, 275-gallon totes and bulk quantities. AMSOIL Industrial Lubricants are stocked in Superior, Wisconsin and in select regional distribution centers throughout the United States and Canada. AMSOIL will stock additional quantities of lubricants or special-order products based on customer requests and regional demands. For applications and recommendations, contact us at 800-579-0580 or the AMSOIL Technical Services Department. For complete technical properties of the AMSOIL Biodegradable Hydraulic Oil please view or print our color data sheet. AMSOIL's RC Series lubricants are made from high quality synthetic base stocks and additive systems. This product prevents wear and protects equipment by maintaining its viscosity, resisting thermal and oxidative breakdown, incorporating anti-wear additives, preventing rust, and resisting the degrading effects of water. AMSOIL lubricants are very shear-stable and oxidation-resistant, which prevents viscosity loss from mechanical shear and viscosity increase from oxidation. In addition, the high viscosity index and low pour points allow for extended temperature protection and performance. AMSOIL RC Series Oils are fluid at cold temperatures--providing easier startups, quick lubricant circulation and limiting the need for sump heaters. At higher temperatures, AMSOIL maintains a thick lubricating film, reducing metal-to-metal contact and component wear. Hydrolytic stability (stability in the presence of water) and demulsibility (ability to readily separate from water) are important features provided by the RC Series lubricants. This increases lubricant life, prevents oil/water emulsions, and allows for reservoirs to be drained of water caused by the environment, processes or condensation. AMSOIL's unique combination of synthetic base oils and additives extends service life and operating temperatures while providing clean, problem-free operation. The lighter viscosity AMSOIL RC Series oils provide superior protection in high and low pressure gear, vane and piston hydraulic systems, compressors, high speed bearings, small gear sets, pumps, high speed spindles, high speed gear, and many other industrial applications. Higher viscosity grades of RC oils, beginning with RCI (ISO 46) meet AGMA specifications for R&O and Synthetic gear oil specifications 1 through 8, respectively, for the lubrication of intermediate-speed equipment where mild shock loading and intermittent service are involved. These applications include machine tools, roller chains, gear reducers, cone drives, large motor bearings, medium-speed ball and roller bearings, blowers, and worm gear sets. Consult the manufacturer for proper viscosity recommendations. The ability of RC Series oils to extend drain intervals is subject to operating environments and maintenance practices and should be monitored by oil analysis. NOTE: AMSOIL RC Series oils are not designed for applications requiring Extreme Pressure (EP) agents. For EP fortified lubricants, please refer to AMSOIL SG Series Gear Oils. The performance characteristics of the WL Series make them ideal for chain and gear applications. These oils are friction-reducing, compatible with seals and paints and are resistant to water. The tackifier agents used ensure the components have constant lubrication, allowing the EP additives to prevent rust. The semi-synthetic nature of the WL Oils delivers excellent performance in a wide variety of environments. AMSOIL RCE is a premium light-weight synthetic lubricant designed to provide the necessary lubricant requirements of high-speed spindles and bearings on spinning frames and modern industrial equipment. RCE is rust and oxidation inhibited, therefore, it protects surfaces against rust and corrosion, and the product resists oxidation at high temperatures commonly experienced at the lubrication point of high-speed activity. Oxidation resistance, a critical features, virtually eliminates carbon and varnish formation on the high-speed parts, extending trouble-free operation of both lubricant and equipment. Because of RCE's enhanced lubricity and antiwear properties, it reduces friction and component wear, which in turn reduces heat, further enhancing the product's oxidation resistance. RCE is water white and does not contain colored chemicals or additives and is considered non-staining.